Imagine a morning just after the floods have subsided, you reach your office and find that everything from the desks to the cabinets are drowned in knee-deep water. Worse, all your important papers and documents are floating atop, making it a miserable sight. At such a time, if your first question happens to be whether your paper records have a backup, then you are surely in for trouble. Asking such a question implies that you are unsure and that means awaiting a disaster. All businesses have scores of paperwork strewn all over in drawers and cabinets. There are documents, receipts, forms and various other papers that are indeed important to be stored and kept secure. In times of disaster, a more relevant question is how long it would be before you can recover all that lost paperwork. Now, you’d ask how the restoration of paper records is possible. It is not only possible, but very practical and cost-effective too. 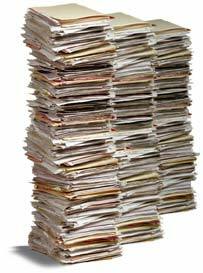 The best method to do it is by digitising all your paper records. By converting all your paper work and documents into digital copies, you safeguard your company from catastrophic losses in the event of a calamity. This digital conversion of paper records includes converting all previous and existing paperwork along with client information. Scanning all the physical documents and saving them in their electronic format is the crux of digital conversion of data. It may appear to be very expensive once you decide to digitise all your paperwork. However, if you calculate the cost savings it will lead to in the long run, you’ll realise that it’s worth all the money and effort. Scanning process is a quick and reliable process that results in complete data security without compromising on data security and availability. You may consider doing this task in-house or outsourcing it to a company that provides document scanning service. If you go with the first option i.e. doing it in-house, you might want to hire an employee on a temporary basis. It is a time-consuming job and engaging an existing employee in it might lead to resource crunch along with over-burdening of that employee. Hiring the services of a company or vendor, therefore, is a viable alternative. It will ensure that your employees are not burdened with this task. Moreover, a company specialised in the task will convert your paper files into high quality and lasting formats. What to do before initiating the digitisation process? You have decided that you will outsource the task and have also zeroed in on the company through various checks and references. Yes, before the actual work begins, there are certain things to consider before you begin the process. 1. Which files need to be converted? You need to assess files and documents before sending them to the vendor. As you do this, you’ll realise that not everything needs to be scanned. This will help you ease out the clutter from your office too. 2. What’s the priority of the files? You’d want to define the importance of the files based on which they will be made available to you. Some, you might need frequently, while others can be stashed away until required. 3. What is the file format to be used? This is a question to be posed to your vendor. Make sure you have easy access to it, without having to look for a new software or programme to run it. This is another one for your vendor. Once again, the priority of documents can be defined according to this. When a task is managed well and is in the hands of expert and skilful professionals, the advantages are many. This applies to digitisation of your paperwork too. Digitisation gives you increased accessibility to your documents. It helps integrate records and facilitates sharing them widely. Along with improved efficiency, it will also reduce the clutter in your office. Therefore, it is critical to include the estimate for digital conversion of paper records in your monthly or yearly budget. This will not only avoid any delay or cost overruns later, but also keep your mind free of any worries with respect to your files and documents. Nathan Morgan has been an IT professional for 14 years. His work is currently focused on Linux servers. He has encryption experience including the deployment of True Crypt and similar packages, and a detailed knowledge of the document scanning service industry.